click on the image above to download our all new 2016 (8-page) advertising guide. Since 1986, our award-winning Technical Support Magazine has delivered NaSPA members the finest in contemporary technical content. In order to keep our magazine fresh and relevant we encourage contributors from anyone, even if you are a NaSPA advertiser, and especially if you are a corporate member, or sponsor. As long as your article is relevant and not an overt sales pitch, we will evaluate it for publication in Technical Support or Network Support Magazine. If we accept your article you will receive a free Full Voting Membership in NaSPA, along with the satisfaction that comes with being a published subject matter expert. You also receive discounts on advertising. For example, if your article is published you receive a FREE ¼ page ad in the magazine or can upgrade to a full page ad (a $1500 value) for only $750. Oftentimes our sponsors run articles and white papers right along with their ads. Email your article to editor@naspa.com or contact advertising@naspa.com for more information. Never publish before but have something to say? We are a good place to start! First-time authors or college students are also welcome and may be eligible for a no-cost Full Voting Membership and other benefits if their article is accepted. 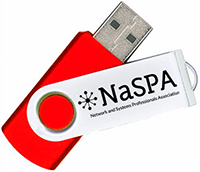 And don't forget, Student and Faculty memberships in NaSPA are still free except for only a very small donation for verification.